I don't remember when I provided my phone number to Stack Overflow. I don't want people to be able to find my name by my phone number. I can't remove it via account settings. Why did this result appear in Google search? There is no phone number displayed in my CV. Well, I think that's because my number is specified in the CV page source code. How does StackOverflow know my phone number? Why does StackOverflow disclose it? Is it intentional? Thanks for finding this. We've fixed it immediately as it was never supposed to be exposed information. The phone number is listed under your Job Match preferences and would be used as a way for employers to contact you if you have expressed interest in being contacted or when you’ve applied for a job. Should you want to change or remove the phone number from your profile, that is where it is located. The only place the phone should ever been seen is to you as the user in your settings, to employers who you expressed interest in or applied to a job for, or on the PDF view of your Developer Story. We never meant for this to be exposed elsewhere and the issue has been fixed. 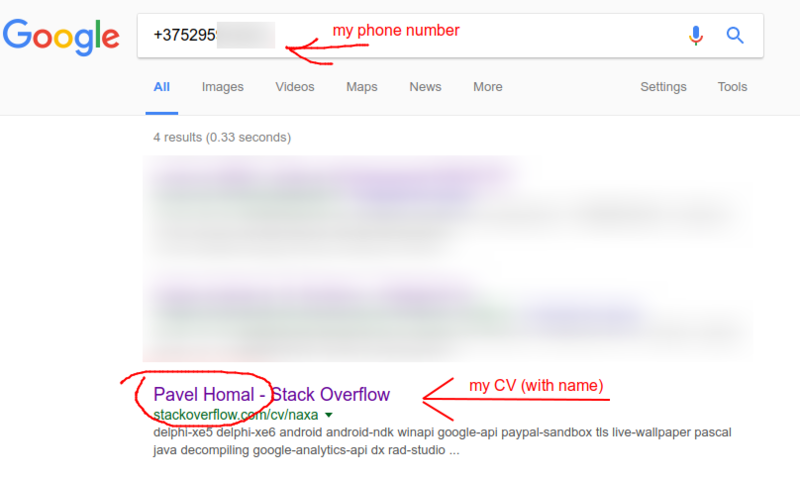 I get a result of my Stack Overflow CV that has no mention of my email on that page. Not the answer you're looking for? Browse other questions tagged bug status-completed developer-story privacy personal-data . How to deal with ignored bugs?